How to create a PDF QR code? Grab the URL of the digital marketing material and link it from the markdown card (mobile landing pages). Generate a QR code on the Beaconstac platform and assign the landing page to it. If you are not looking to create landing pages and want to send users directly to the PDF, skip step 1 and 2. Start by creating a QR code for the digital PDF. The straightforward approach to delivering online documents is to include a short URL on the sales receipt, product packaging or on posters. However, the challenge with this approach is, it works only if users remember to visit the URL. It also involves manual typing of URLs which is fine when the URL in picture is short. But it gets complicated and risky for longer URLs. PDFs are compact and easy to exchange. This is why PDF QR codes are easiest and most seamless way to learn about products or services in detail. Since the material is being sent to the smartphone, the users save these documents for future reference and usage. Hit the right audience and generate high quality leads at events you attend. Give them quick access to eBooks, interview documentations, or property listings in your locality, and all it would require of them is to point their smartphone cameras to the QR code and scan! From in-store posters to pamphlets to product packaging and more, PDF QR codes can be used extensively to boost engagement and store interactivity. Stick QR codes on product aisles, packaging and posters. Allow users to scan and access user manuals, product comparison sheets, tips, inspirations, best practices, related products or product reviews before they move onto other errands of the day. Send forms and other annexures that need to be filled and submitted at banks. You could also send sample application forms to new users trying to open a bank account at your branch. 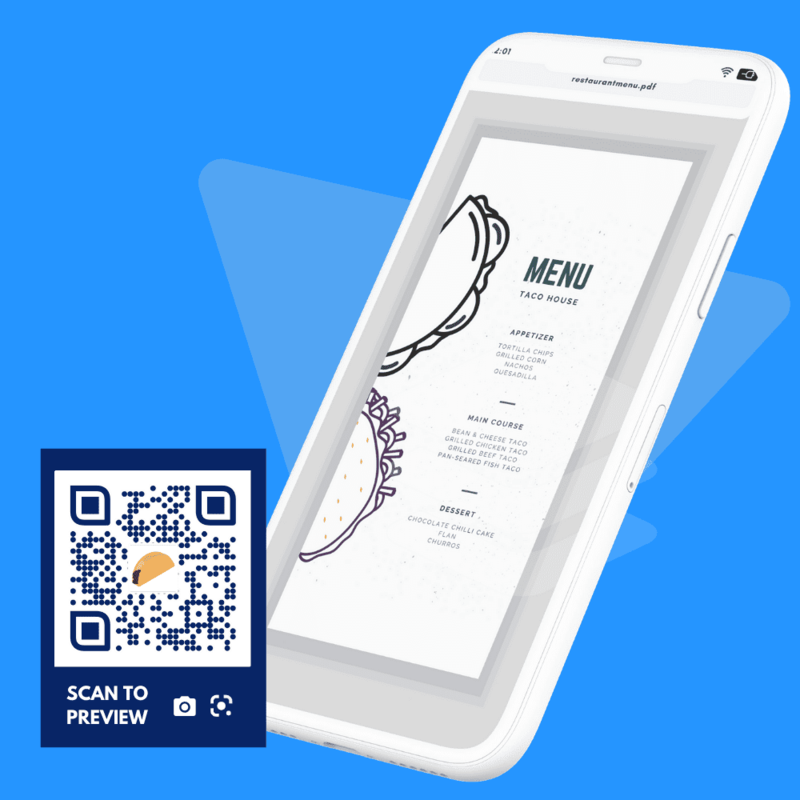 Send restaurant menus or daily specials by allowing diners to scan a QR code on their table. You could also send quality certifications or a collections of photos - maybe of local celebrities who visited your restaurant or just happy people stopping by to enjoy a premium lunch! This industry involves excessive use of PDF and documents - starting from property listings, to filling out property requirements, digital catalogues, real estate magazines, to soft copies of house documents. To make these pieces of information more accessible and handy, tech savvy realtors are opting for PDF QR codes. Multi-campaign (dynamic) QR codes are especially helpful for latest property listings because you print and distribute the QR code once, and then keep updating new properties as and when required. One of the biggest reasons people refrain from scanning QR codes is that they do not know what is behind the QR code. Adding a PDF logo in the center gives an indication of what to expect. Since PDF QR codes direct to viewing on mobile devices, the readability of fonts, the size of the PDF and the overall formatting plays a major role. Use PDFs that read well on mobile screens. Avoid using multi-column text in PDFs, as it becomes difficult to navigate through these. Pick the right size of QR codes. Marketers usually tend to optimize for size, especially on product packages so that multiple other highlights could fit in. But too small QR codes tend to go unnoticed and end up being unscannable. These QR codes should be at a minimum of 2cm x 2cm. Promote your mobile app downloads by adding QR codes on marketing collaterals and linking them to app-stores.